We use highly advanced machineries in crushing iron ore. The final product that you get is fully crushed iron ore. Our iron ore crushing services are well-known for their high reliability as well as effectuality and thus you can freely go for it. SBM Iron ore crushing plant mainly includes crushing, grinding and screening. It can be replaced the first three stages of ore processing or ore dressing. For soft feed a horizontal shaft impactor is normally the first option if capacity is not too high. For harder feed there is a choice between a gyratory crusher also named jaw crusher. In a rock crushing circuit, the second stage normally starts to be of importance for control of size and shape. The secondary crusher use cone crusher frequently. This step you can use cone crushers or vertical shaft impact crusher. 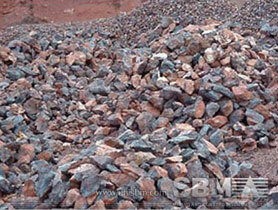 SBM can offer types of stone crushers for iron ore crushing plant in Indonesia, and China. Mobile iron ore crusher is widely used iron ore crushing machine. Jaw crusher and roll crusher is also used in iron ore crushing plant for crushing iron ores into 5 mm powder. "SBM supplies types of iron ore crusher machines with high crushing capacity and effective working time for our iron ore concentrator."